In an effort to prove it is serious about tackling the Australian agitator market, Isuzu has added to an already comprehensive Australian model range by announcing the arrival of load-sharing twin-steer models. 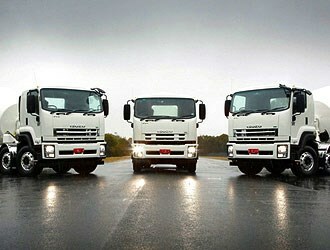 The new Isuzu FYH and FYJ models are available in both 8x4 and 10x4 axle configurations. The new Isuzu FYH and FYJ models are available in both 8x4 and 10x4 axle configurations and follow hot on the heels of the purpose-built 6x4 agitator model earlier this year. The new axle configurations give the 8x4 a gross vehicle mass of 30,000kg and a gross combination mass of 42,000kg while the locally developed and engineered 10x4 will provide a GVM of up to 35,000kg depending on model and spec. The heavy duty models will depend on Isuzu's 10 litre SITEC Series 3 engine that puts out 265kW (355hp) and develops 1472Nm of torque. Isuzu has opted for neither selective catalytic reduction (SCR) nor exhaust gas recirculation (EGR) to satisfy ADR80/03 emission laws. Instead the engine relies on a di-oxy catalyst (DOC) to meet current smog requirements. A DOC is a passive after-treatment that doesn't require a regeneration cycle or the use of diesel exhaust fluid (DEF). The trucks will also available with a manual 10-speed Eaton transmission, a nine-speed ZF manual, or Allison's heavy duty 4,430 torque converter automatic gearbox, highlighting Isuzu's intent to take on the big boys in the cement mixer business. The load-sharing twin steer uses twin Meritor axles and damped mechanical load share suspension or 'rocker' type suspension system to allow the double axle set up to cope with the extra load capacity. This is also reported to provide good road holding capabilities as well. Rear suspension options include Isuzu rod steel springs and Hendrickson HAS461 air bags. "While Isuzu has dominated the light and medium duty market segments for many years our product offering in the heavy duty sector has been limited," Isuzu Australia Director Phil Taylor says. "The launch of the FY series with its three models (nine variants) will go a considerable way to addressing this. "The key component of the FY range is that it introduces a 8x4 and 10x4 to the Isuzu product line-up, this is a specification that has been noticeable absent from our offering until now."